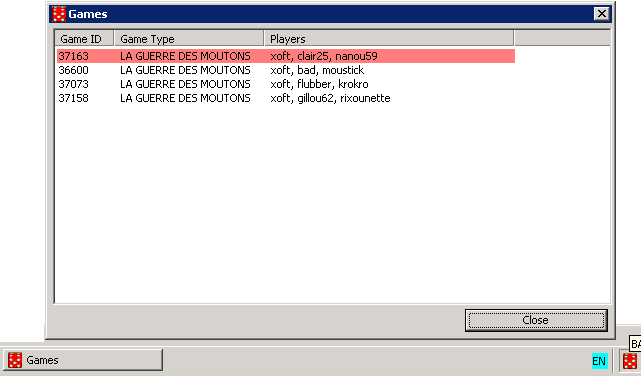 This little utility is for the community of boiteajeux.net players. It can check the website and notify them of games where it's their turn. The program can be either locally installed or run from a flashdrive ("portable" version). To install, simply extract all files to a folder of Your choice. Upon first run, the program asks for basic settings - mainly the BaJ username. Then it sits as an icon in the system tray, changing color if the user is on turn in any game. Doubleclicking the icon brings up a list of user's games with highlighted items that are waiting for the user to take their turn. Doubleclicking any game will open up that game in default web browser (BaJ auto-login required). The Gamelist shows highlighted games in which it is the player's turn. Doubleclicking any row will open up the game in the default web browser. The settings window allows to set username and whether to notify using a flashing system tray icon or a sound. The soundfile can be configured (WAV files supported). NOTE: Older versions have been confirmed to leak memory, leading to memory usage up to 1.5 GiB when running for a long time. These versions are not recommended for general use! 2012_01_12a Fixed a crash in the HTML parser. 2012_01_11a Fixed several memory leaks. Memory usage now seems stable for long runs. 2011_06_01a Re-Fixed a GDI object leak bug (Icons need DestroyIcon(), not DeleteObject()). Fixed page parsing when user chooses English translation. Check interval lowered to once in a minute.